Our pendulum regulator provides automated time adjustment for weight driven tower and church clocks by eliminating the need for regular manual adjustment. 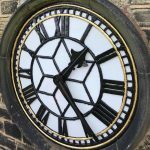 We know that all clocks will vary somewhat in timekeeping accuracy, due to temperature and climate variations and, if left unchecked, timekeeping errors will accumulate over weeks and months meaning your clock will show the wrong time. 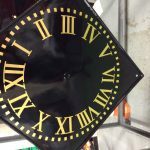 With our PAR-100 system installed, our clockmakers will calculate the amount by which your clock will always gain time. This enables the regulator to pause the clock momentarily at regular intervals, in order for “real time” to catch up with clock time. There will not be any noticeable difference to the displayed time on an hour-by-hour basis, as the gain is small and the pause time usually lasts only a few seconds. Our Pendulum Regulator system will improve the timekeeping of any tower or church clock, whether automatic winding is fitted or not. If the clock is equipped with our Automatic Winding AW10 system, then the PAR-100 can run off the same power supply unit, which is configured to run both systems together. Our PAR-100 automatically takes care of clock altering for summer/winter time changes. The dates and times are pre-programmed into the control unit, and your clock will pause for eleven hours (effectively forward by one hour) in the spring and one hour (back) in the autumn. If your clock has night silencing, the spring time change can be programmed for 23 hours to maintain chiming continuity.